Looking for Decking Timber in Perth? Whether you are an experienced full time deck builder or a newcomer to deck building, you will require quality decking timber and materials to complete your project/s successfully. When trying to select a timber, consideration should be given to climate, soil type, airflow, moisture and more. Failing to carefully consider all of these points and selecting the incorrect timber could potentially cause the structure to be problematic, weak or even be unstable over time thru timber failure. An experienced and knowledgeable deck builder will provide free expert advice in regards to the best decking timbers for your particular project. There are a plethora of different decking timbers to select from in WA. Read more about how to select the correct timber for your project. In addition to decking timber, you will also require hardware supplies to construct your new deck. Essential hardware may include stirrups, concrete, screws, a countersink tool, spacing template and bolts. Meanwhile, you may also require steel wire balustrading to create a safe and effective boundary around your structure. All outdoor timber structures should be regularly maintained in order to maximise their strength and appearance. The frequency at which you should maintain your deck will be dictated by the type of timber that you select. Furthermore, decking that receives higher levels of sun and/or traffic will require more regular maintenance. There are DIY timber decking sealers available to purchase or alternatively you can engage a professional to seal your deck. 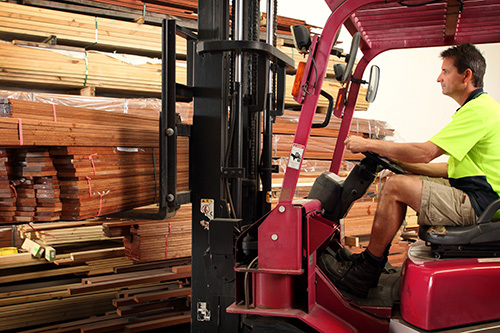 We have a warehouse located in High Wycombe that offers a broad range of affordable timber supplies. Furthermore, we stock decking hardware including concrete, stirrups, bolts and screws. You can also pickup a FREE step-by-step guide to DIY Decking from our warehouse. This guide includes tips on preparing the site, establishing foundations, the setting of bearers and joists and laying of the boards. Contact Paul today to learn more about decking timber in Perth. Copyright © 2019 Timber Decking Supply Shed.